This made me smile. Ball is where many of the instruments on board Hubble were built. That includes the Space Telescope Imaging Spectrograph, or STIS, one of the finest cameras ever flown in space. And I know: I helped calibrate it. Back in 1994, right after getting my PhD, I got a short-lived job working on COBE, which at the time was winding down after a long and highly successful mission. But because the project was closing down, it was a difficult work environment (which is true for any project): the computing equipment was aging, the money was tight, and the only problems left to solve were ones that were extremely difficult — and in my case, intractable. The writing on the wall was clear enough. I started applying for other jobs almost immediately (a sad but common state for people with astronomy degrees) and happily was offered a position with a different company at Goddard Space Flight Center working on calibrating STIS, which was just starting to be built. That meant new equipment, more money, and a project with years of work ahead of it. Not being an idiot, I took it. 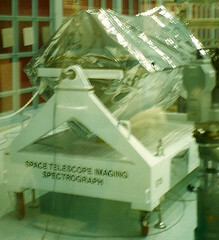 in its clean room at GSFC in 1996. After a few months, STIS was complete enough that it was time to start testing it. STIS was being built at — you guessed it — Ball in Boulder, and we all took turns flying out to Colorado to work on the new camera. It was in a clean room in a warehouse together with NICMOS, another camera slated to be taken up to Hubble. We sat in a little cubicled-off area with computers and a storage locker full of snacks, and got down to the business of examining the data from the camera. It was the first time I had been to Boulder, and I loved it. Even working 12 (and once an 18) hour shifts, it was a great place to be. What a gorgeous area, and a friendly town! I dreamed of living there one day, but figured that would never happen. 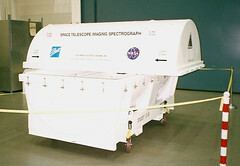 STIS in 1996, ready to ship for launch. Heh. I worked on STIS for 6 years, watching it finish getting built; standing in awe on a cold February Florida morning as the Shuttle Discovery roared into the night, carrying the camera to Hubble; testing the camera on-orbit to make sure it behaved as expected then having the honor and privilege of using it to observe objects as close as the Moon and as distant as a gamma-ray burst nine billion light years away. Then, in 2000, when STIS funding was winding down, I had to choose between staying with the company (and working on the Cosmic Origins Spectrograph, which was installed on Hubble just yesterday), or pursuing a new career in education and public outreach. I found I was enjoying talking about and even evangelizing science more than doing the research, so I took this new path, and off I went to California with my family. And after 6 years there, I was offered the chance to write a second book, and so I took it. When my wife mentioned that we could live anywhere in the country if I became a full-time writer — and then specifically suggested Boulder — that made the decision easier. So here I am now, after all those years and all that distance and all those different careers, living in Boulder. And as I write these very words, astronauts are in orbit above my head preparing to work on STIS once again, hoping to replace some electronics that burned out back in 2004, resurrecting the dead camera so it can continue the work it once did. So pardon me this self-indulgence. But seeing that sign brought it all back to me, and watching the NASA video live as it happens hammers it home. We live in a time where people go to space to work on telescopes that observe the Universe, from here to infinity. And sometimes the dice fall the right way, and guys like me get to lend a hand. So I’ll be watching them today as they work on that old box of wires and mirrors and filters and chips, watching very carefully indeed. I’m a skeptic, so I won’t wish them good luck, or godspeed, or anything like that. I know that science and engineering and thousands of hours of training trump superstition. But I’ll be leaning over my computer screen, hanging on every action the astronauts take just the same. Do well, my friends, and treat my baby right.